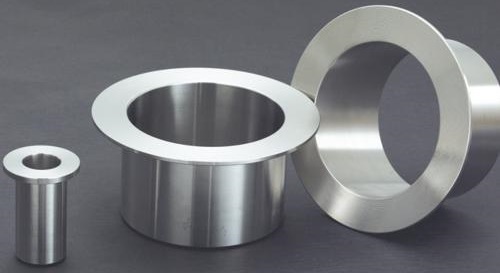 Usually, titanium stub ends are used with ASME B16.5 carbon steel backing flanges (lap joint flanges) in pipeline to minimize the cost while maintaining excellent corrosion resistance to fluid. The stub ends may be furnished in short pattern or long pattern in accordance with ASME B16.9. The material covers Grade 1, Grade 2, Grade 3, Grade 5, Grade 7, Grade 9, Grade 12, Grade 16 titanium and its alloys, which shall be made in accordance with ASTM B363. For sizes NPS 6 and smaller, the titanium stub ends will be furnished in seamless type (ASTM B861); for sizes larger than NPS 6, the titanium stub ends will be furnished in welded type (ASTM B265). Application of titanium stub ends: pulp and paper industry, water and seawater service, chemical processes involving oxidizing media and oxidizing acids. 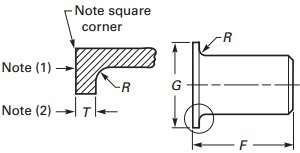 Grade 2 titanium stub ends: short pattern and long pattern. *Dimensions are presented with both metric and US Customary units. *Short pattern titanium stub ends are applicable for ASME B16.5 flanges of 300#, 600#, and 900#. *Long pattern titanium stub ends are applicable for AMSE B16.5 flanges of 1500# and 2500#. *Custom-designed titanium stub ends can be manufactured upon request.